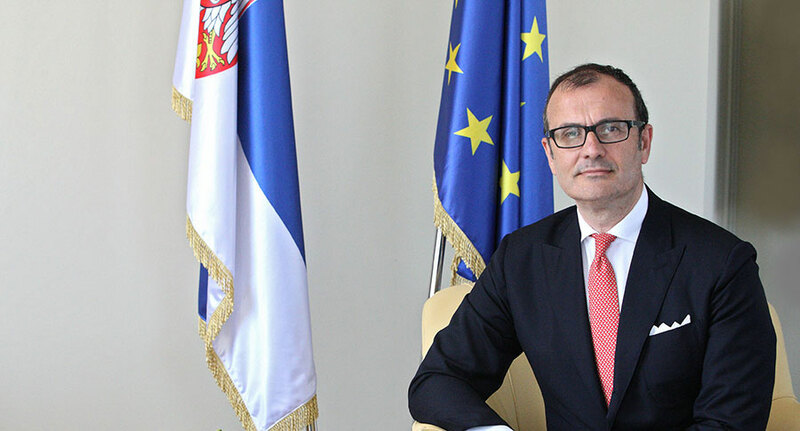 Appearing on N1 TV, Head of the EU Delegation to Serbia Sem Fabrizi said that there is a credible enlargement perspective and that countries in the region should focus on reform implementation and meeting the established criteria. “Yesterday’s development marks an important political initiative spearheaded by President Juncker and the entire European Commission. Back in 2014, he said that no country was ready to join the EU, so we should now focus on what was said yesterday,” Fabrizi says. The Ambassador said that the Strategy carried numerous political implications and set out many initiatives, describing them as good news for Europe and its effort to regain a position in the political space. “For the first time, there is a credible enlargement perspective. For instance, Serbia and Montenegro, the countries that have already started accession talks, are now given a chance to join the EU by 2025. The strategy has set out steps that could lead to enlargement, but those countries should now focus on reform implementation and meeting the established criteria,” he said. Fabrizi said that the European Union was built around the concepts of responsibility and solidarity, adding that any EU-aspiring country should reform its society from the ground up. “Serbia started the accession talks in 2014, numerous reforms have been implemented, and others will ensue. Serbia should be fully committed to reforms. Lastly, there is an element of normalisation of relations with Pristina, which is a key element in the process,” Fabrizi said. He added that the EU expected a comprehensive normalisation of relations to be carried out according to a plan and a strategy, as well as the reaching of a legally binding agreement that would lead to normalisation, the one both Serbia and Kosovo must agree upon. “It is not up to me to talk about the substance of the agreement; Hahn said that it was much too early to define its contents. There is, indeed, need for speed, but it is up to Belgrade and Pristina to define the contents of that agreement. We are here only to help,” said Head of the EU Delegation to Serbia. “We are talking about an important concept, one that has to do with the functioning of society and democracy. You need the entire society to have your back, and the rule of law must be at the heart of such a commitment,” Fabrizi said. He said that laws should be adopted and enforced as a reform package. “This process is more than a mere formality; laws are being adopted for the benefit of Serbian citizens, not because the EU says so,” Fabrizi said. “We are compiling a periodic report on the state of accession process and will publish it in April, we are working on it. Also, we are publishing our regular report, with a section dedicated to the freedom of media and expression,” Fabrizi noted and added that EU accession must be an on-going process. “We have to open and close 35 chapters; it is a very complex process. If we take the year 2025 as a realistic date, we will have to act fast because 2025 is practically around the corner,” Fabrizi told N1.